Last Sunday the OGlam Agency presented the first show for PNP Poses made by Spishak Sorbet. Spishak Sorbet made a lot of new runway poses that were show cased by the OGlam models. It was an honor as well as a pleasure for me, that I was allowed to be part of that amazing show. The show was sponsored by Apple May, Azoury, Sascha’s Design, Champagne, Priviledge, !Silken Moon and Finesmith Designs. To give a short impression of that amazing show I would like to show you the outfits and poses I was allowed to showcase on the Runway. My first outfit came from Apple May and was called “Cheery”. For skins we were sent to !Silken Moon and for “Cheery” I decided to wear the “Blog Frog” skin of the Rebel II series. The green eyeshadow and lips were the perfect addition to the color- and playful outfit. The jewelry for sure comes from Finesmith – and yes it is no secret that I adore yula’s creations as well as her genius designing skills and ideas 😉 – for this outfit I chose parts of the new “Rusalka Inspiration” set that matched the colors of the outfit and skin perfectly! For shoes we were allowed to pick from the great Mary Jane Shoes, made by Infiniti Mirihi. For this outfit the new “Cheeky” pumps in red where the perfect addition. For this outfit I picked poses from PNP of the “PNP Runway – Mode” series. For this outfit I used the “PNP Runway – Dress” poses 11, 44, 51, 56 and 63. My 4th outfit was made by Champagne with a signature face tattoo from Garded Secret, that was made especially for this outfit called “Samba”. The skin is the same as I used for my first outfit and the shoes again came from Mary Jane Shoes, this time the “Strapped Stiletto” in cyan. The earrings are part of the “Valeria Inspiration” set, what is a limited set from Finesmith Designs. 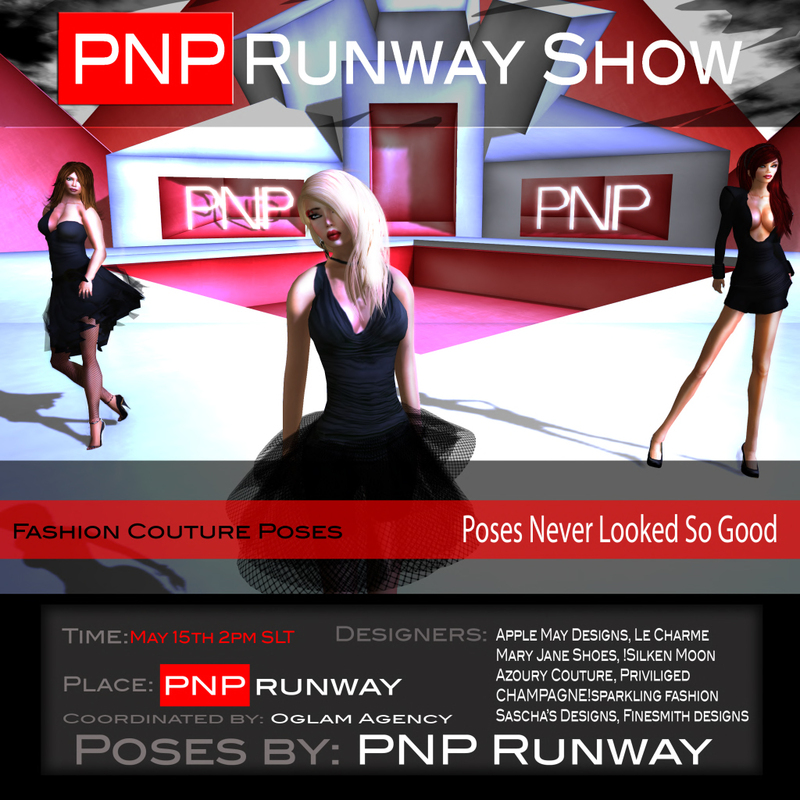 For the “Samba” outfit I mixed poses of the “PNP Runway Haute” set and the “PNP Runway Dress” poses. From the “Haute” set I used the 2, 7, 10, 19 and the number 55 of the “Dress” series. My last outfit for the PNP Pose Show was from Priviliged and it is called “Isadora Exclusive”. The skin is the last of the 4 Rebel II skins and named “Funny Bunny”, the jewelry set is the “January Colletion” from Finesmith Designs, the shoes are again a pair of the great Mary Jane Shoes – the “Satin Pumps” in white. 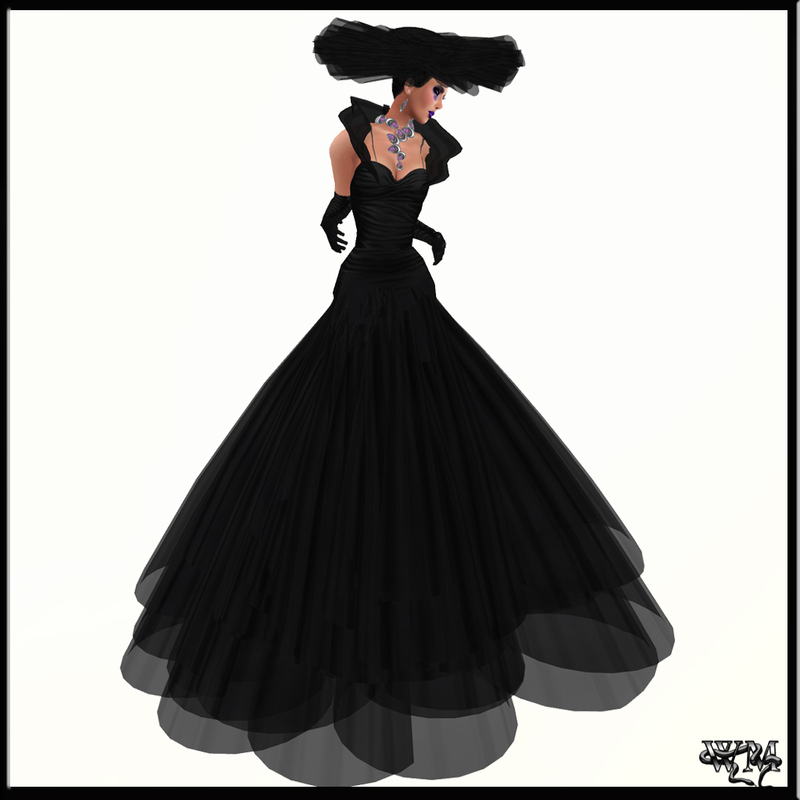 This time I again used poses from the “PNP Runway Dress” line to showcase the wonderful gown. I chose the numbers 8, 18, 20, 23, 26 and 27. This entry was posted in Events & Contests, Fashion, New Releases, Poses and tagged 3D, 3D people, Apple May, Art, Azoury, Blog, Blogger, Bridal, Casual, Catwalk, Champagne, Chic, Clothing, Couture, Dress, Earrings, Fashion, Fashion Show, Female Clothing, female wear, Finesmith, Finesmith Designs, Formal, formal attire, Gown, Hair, Infiniti Mirihi, Infinity Mirihi, Inspiration Set, Jewelry, Lybra Rage, male clothing, Mary Jane Shoes, meta virtual, MJS, Model, Modeling, Necklace, New, New Release, New Releases, News, OGlam Agency, photographer, PNP, PNP Poses, Pose, Poses, Priviliged, PurpleMoon, Runway, Runway Show, Sascha's Design, Second Life, Secondlife, Show, Skin, SL, SL Clothing, SL Fashion, SL Style, Spish Davidson, Spishak Sorbet, Style, Vanity Hair, Virtual World, WEdding, Wicca Merlin, woman, Yula Finesmith. Bookmark the permalink.